A French national insignia was first introduced by a decree dated 26 July 1912. 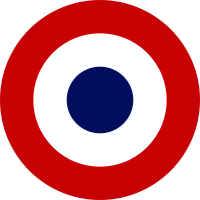 It consisted of a roundel in the colours of the French Revolution – red, white and blue. This marking was displayed above and below each wing. The fin flash was usually displayed in the form of rudder stripes. The roundel was not carried on the fuselage sides until 1918. No service titles were carried. Under the Vichy government, French military aircraft had red and yellow horizontal stripes added to the engine cowling and tail unit. The main markings included a thin yellow outline. The roundel was displayed in 6 positions – i.e. above and below each wing, and on each side of the fuselage. The fin flash was usually displayed in the form of rudder stripes. No service titles were carried. After the liberation of France from Nazi control, the Vichy markings were removed. The main markings were unchanged. The roundel is displayed in 6 positions – (i.e. above and below each wing, and on each side of the fuselage) on aircraft – but on the fuselage sides only on helicopters. The fin flash is nowadays rarely carried by frontline types, but on second-line types is usually displayed in the form of rudder stripes.